Marguerite Yourcenar (French pronunciation: ​[maʁɡəʁit juʁsənaʁ]; 8 June 1903 – 17 December 1987) was a French novelist and essayist born in Brussels, Belgium, who became a US citizen in 1947. Winner of the Prix Femina and the Erasmus Prize, she was the first woman elected to the Académie française, in 1980, and the seventeenth person to occupy seat 3. Yourcenar was born Marguerite Antoinette Jeanne Marie Ghislaine Cleenewerck de Crayencour in Brussels, Belgium, to Michel Cleenewerck de Crayencour, of French bourgeois descent, originating from French Flanders, and a Belgian mother, Fernande de Cartier de Marchienne, of Belgian nobility, who died ten days after her birth. She grew up in the home of her paternal grandmother. She adopted the surname Yourcenar – an almost anagram of Crayencour, having one fewer c – as a pen name; in 1947 she also took it as her legal surname. In 1939, her intimate companion at the time, the literary scholar and Kansas City native Grace Frick, invited Yourcenar to the United States to escape the outbreak of World War II in Europe. She lectured in comparative literature in New York City and Sarah Lawrence College. Yourcenar was lesbian; she and Frick became lovers in 1937 and remained together until Frick's death in 1979. After ten years spent in Hartford, Connecticut, they bought a house in Northeast Harbor, Maine, on Mount Desert Island, where they lived for decades. They are buried alongside each other at Brookside Cemetery, Mount Desert, Maine. 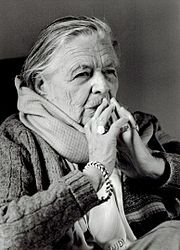 In 1980, Yourcenar was the first female member elected to the Académie française. An anecdote tells of how the bathroom labels were then changed in this male-dominated institution: "Messieurs|Marguerite Yourcenar" (Gents/Marguerite Yourcenar). She published many novels, essays, and poems, as well as three volumes of memoirs. Marguerite Yourcenar's funeral plate. The epitaph, written in French, is from The Abyss: «Plaise à Celui qui Est peut-être de dilater le cœur de l'homme à la mesure de toute la vie.», which can be translated to "May it please the One who perchance is to expand the human heart to life's full measure." 2003, 12 November: Belgium issues a postage stamp (Code 200320B) with the value of 0.59 Euro. Comme l'eau qui coule (1982) translated as Two Lives and a Dream. Includes "Anna, Soror...", "An Obscure Man", and "A Lovely Morning". A Blue Tale and Other Stories; ISBN 0-226-96530-9. Three stories written between 1927 and 1930, translated and published 1995. ^ George Stade (1990). European Writers: Twentieth Century. Scribner. p. 2536. ISBN 978-0-684-19158-4. ^ Joan Acocella (14 February 2005). "Becoming the Emperor". The New Yorker. Retrieved 8 January 2009. ^ "Marguerite Yourcenar". 21 February 2002. Retrieved 11 September 2013. ^ "Book of Members, 1780–2010: Chapter Y" (PDF). American Academy of Arts and Sciences. Retrieved 22 July 2014. ^ "Literatuur op postzegels België 2003" (in Dutch). Filahome.com. Retrieved 17 June 2014. Giorgetto Giorgi, "Il Grand Tour e la scoperta dell’antico nel Labyrinthe du monde di Marguerite Yourcenar," in Sergio Audano, Giovanni Cipriani (ed. ), Aspetti della Fortuna dell'Antico nella Cultura Europea: atti della settima giornata di studi, Sestri Levante, 19 March 2010 (Foggia: Edizioni il Castello, 2011) (Echo, 1), 99–108. Les yeux ouverts, entretiens avec Mathieu Galey (Éditions du Centurion « Les interviews », 1980). Wikimedia Commons has media related to Marguerite Yourcenar. Jacob Stockinger (3 March 2004). "Yourcenar, Marguerite (1903–1987)". glbtq Encyclopedia. Retrieved 8 January 2009.